It is the beginning of winter and in her den in a snow drift Mama Bear gives birth to two tiny cubs. Curious about their surroundings and a little nervous the two bears ask their mother questions about the wider world. She tells them about the landscape, the ice, sea and its creatures and what will happen when they leave their cosy den. 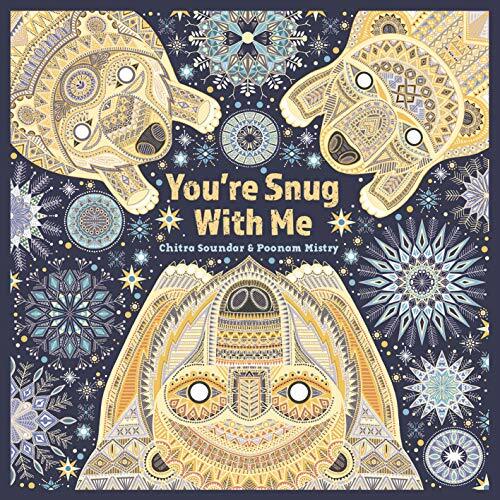 The story reads like a lullaby with the reassuring refrain to the nervous cubs preparing to leave their cosy den as the seasons pass ‘You’re snug with me.’ However it also has an important ecological theme, introducing the incredible array of animals living in the polar lands and suggesting their interdependency and the fragility of their habitat. It highlights our responsibility to look after these creatures and our precious world only taking from it what we need. This message is reiterated in the author’s letter to the reader at the end of the book. The illustrations are stunning. 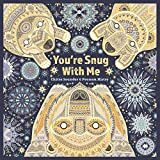 Intricately woven in silver, grey and gold they dazzle the reader revealing the beauty of the Polar Regions and its wildlife. Look closely to spot the two cubs curled inside their mother waiting to be born, peer under the ocean to discover the diversity of life there. Another successful collaboration from the creators of You’re Safe with Me.